In 2001, Laubscher’s Mining Rock Mass Rating (MRMR) classification system (Laubscher and Jakubec, 2001) introduced the rock block strength concept to account for scale effects and the influence of closed defects on intact rock strength (IRS). Almost two decades later, rock mechanics practitioners are still challenged by how to appropriately incorporate defects, other than open breaks, into rock mass classification to arrive at in-situ rock mass rating (IRMR). A category of such defects is micro-defects, which are typically non-systematic with variable geometry and continuity. These fractures can sometimes be difficult to identify, let alone characterise, but they can have a significant impact on important mining considerations, such as the caving process and rock fragment block size (Jakubec et al., 2007). Early stages of mining projects rely almost exclusively on rock core to define rock strength. Assessing the unconfined ‘intact’ strength of the rock core is mostly done by empirical methods, by observing how rock core breaks by hammer blow, and point load and UCS testing. However, in rock where defects are numerous and small, e.g. in porphyry-type rocks, it can be difficult to isolate sections of defect-free rock in which to obtain true intact strength. In such cases, the scale of micro-defects relative to the size of core means that core-scale strength tests reliably account for their influence on the rock strength. The concept of the drop test was introduced and accompanied by the comment that when performed correctly, the drop test yields more consistent results than the hammer blow method. The drop test consists of dropping uniform length sections of the same-sized core horizontally-aligned onto a concrete floor and tabulating the breaks on fractures and through intact rock. The major appeal of the drop test as a core testing tool is its efficiency, simplicity, and repeatability; gravity is a constant so only the drop height datum for the project, e.g. core rack level, need be defined. For rock with high micro-defect intensity, significant utility can be obtained from the drop test by simply counting the number of fragments that the core breaks into. In a recent study, the number of fragments correlated with the micro-defect intensity and point load strength (Figure left). The plot shows that in the unaltered Post Mineral Volcanic unit, the point load test Is(50) values and number of fragments were equally low. In the Tonalite unit, the highly altered Sericite-Chlorite-Clay domain is characterised by zones where there were high numbers of drop test fragments, whereas testing the less altered but similar micro-defect intensity in the Sericite domain resulted in generally fewer fragments and far higher Is(50) values. Although wetting the core helped, it was not always possible to see the fractures in the core. 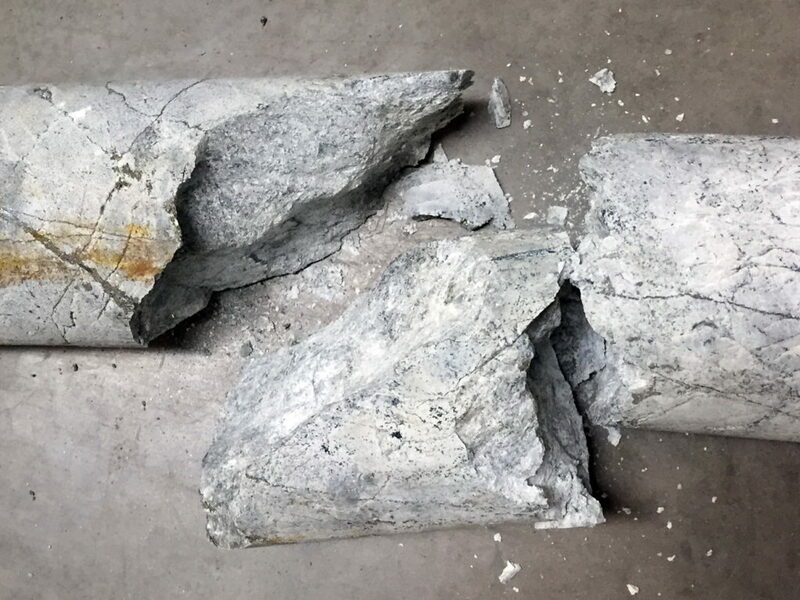 It was impractical to inspect each broken fragment (up to 15 fragments per test) to determine whether breakage was caused by defect or intact rock or a combination thereof. Counting the number of fragments proved to be a quick and practical method of addressing these limitations and assessing how the rock at that scale behaved mechanically. It is important not to ‘double dip’ when selecting intact rock strength reduction to arrive at an IRMR. Although there is no current guidance on relating the drop test to quantitative strength values for rock mass classification schemes, it can be a useful tool to measure the prevalence and influence of micro-defects on the core-scale rock mass. This information can help decide whether, and how much, the intact rock strength needs be reduced or if the reduction is sufficiently captured in the point load and UCS tests.